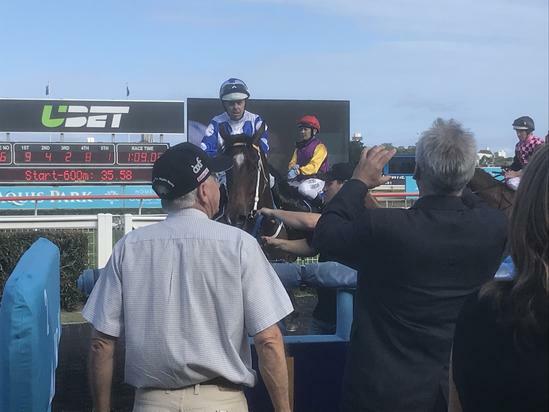 Promising Gelding Luna Missile headed to Aquis Park at the Gold Coast Turf Club today looking to make it two wins from two runs this preparation and completed the mission with ease when taking out the Adbri Masonry Colts and Gedlings Class Two Handicap. The promising son of Smart Missile showed again his above average ability when beginning like a rocket to put pay to an awkward barrier and clear the field and set a strong mid race tempo before unleashing a powerful finish to score by an easy one and three quarter lengths in an impressive time of 109.09. Winning Co Trainer Bryan Guy was a relieved man explaining after the victory how hard it usually is for a horse to go from a maiden to a class one let alone a class two “we put him in the deep end today jumping from a maiden to a class two but we have always had a big opinion of him and given the way he has won both races and the time he has run he looks above average. It’s been a big team effort from the loyal owners, to the staff back at the stables who have done a good job to get him over the couple of issues he has had”. Luna Missile was ridden today by Jackson Morris who was riding the horse for the first time “I can’t say much about the win other then wow, Bryan and Daniel thought the race may have panned out differently but when he began so well and cleared them so quickly it was all over, he gave me a great feel and I think the owners are going to have a lot of fun with this horse”. Luna Missile is owned by a large team of owners that was put together by Wylie Dalziel Roy Higgins Racing and existing Guy Stable clients and Co Trainer Daniel Guy was thrilled for the group “they are a fantastic group of owners who deserve all the success they get, they have been so patient with him and no one has ever doubted our opinion of the horse, it’s great to see this group see raceday what we see every gallop morning”.